My third trimester came and went so fast, It’s hard to believe I was pregnant a few weeks ago. I had a little more nausea, tiredness and physical discomfort than the first two trimesters, but overall it was a good third trimester. While I was pregnant the last trimester (my husband and I don’t plan to have more children), I would remind myself daily that this was my last time I would ever be pregnant and to ENJOY it! 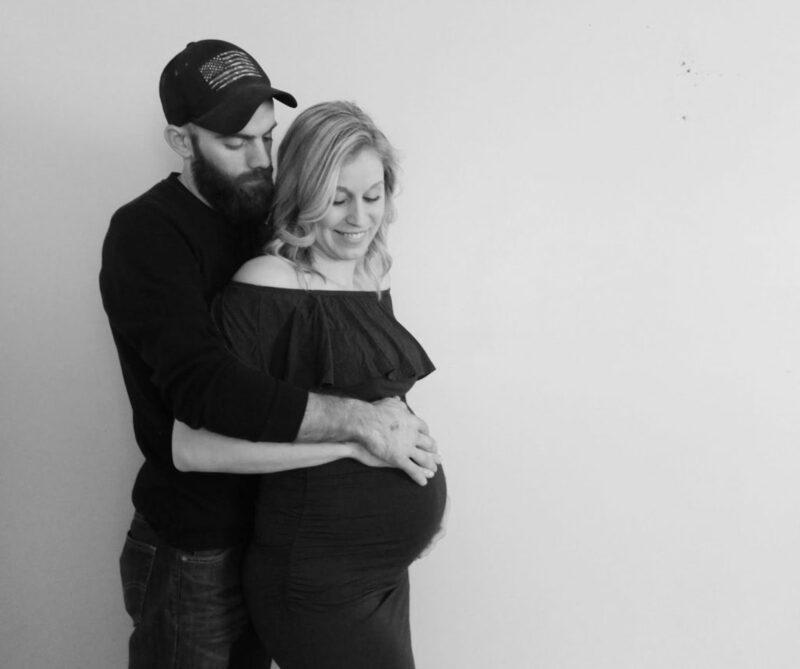 Every time I bent over and grunted, or picked up Dillon and felt weak and uncomfortable, I would remind myself how lucky I was to be so far along in my pregnancy, especially after having a molar miscarriage less than a year prior. I’m happy that I was able to keep those positive thoughts while being the most uncomfortable during my pregnancy. The third trimester had a lot of joyous times that I got to have with loved ones. I had a wonderful baby shower at Nourish Cafe & Market, which I got to make all my favorite foods and share them with my friends and family. A family friend took our family’s maternity photos, which I could not be more in love with! Weighing the heaviest I’ve ever been in my life and feeling the most beautiful was a life-changing feeling. In my marriage to Ryan, I have always been amazed and so grateful for the challenges and growth we have in our relationship because we always communicate better and love each other even more than the days before. Pregnancy/parenting is no exception, and for that, I am grateful to be married to my best friend. Physically during the third trimester, I have been able to maintain working out 5 days a week with at least 3 of those days being hot yoga. At 31 weeks I had to stop running, or rather, it became more like a slow jog because I was getting very deep cramps in my lower abdomen. 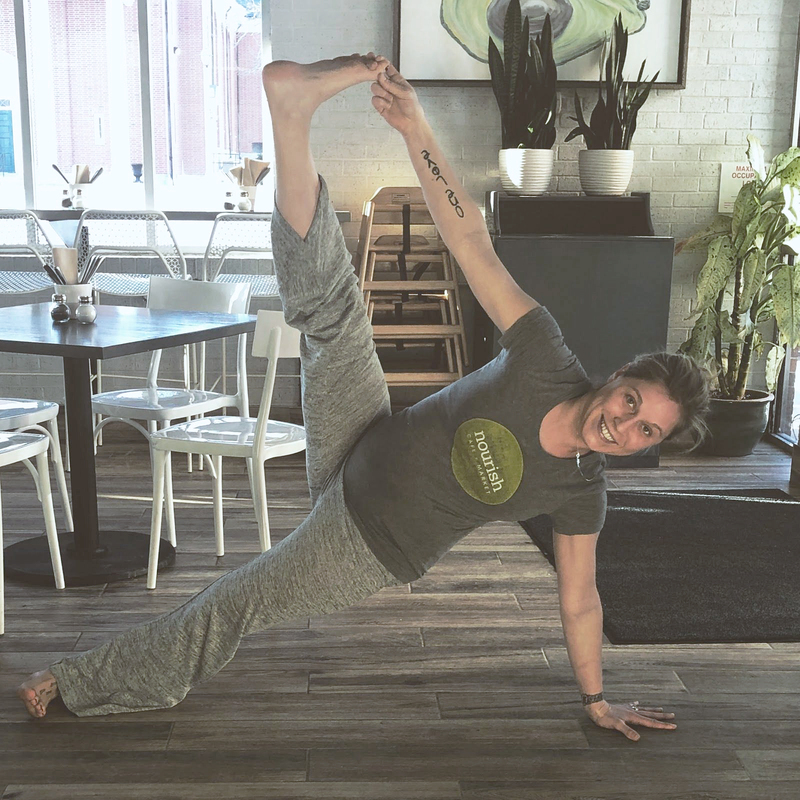 I also would get these cramps while working at Nourish if I would stand or work too long on my feet. (I usually needed to sit down every 2-4 hours.) Yoga was a different story. Yes, I had to limit my poses. No more twists, no deeper forward folds, no more laying on my belly or even doing everything in the sequence but I was more than okay with that. Sometimes we have to temporarily be unselfish and just listen to what our body is telling us and know it’s only temporary. I would do modified lunges, side planks, planks, forward folds, you name it, I modified it. I was able to continue inversions during my whole pregnancy. It was still a very consistent way for me to check in with my body every day and make sure the baby and I were doing fine. I did yoga 20 minutes before my ultrasound, upon which they decided to induce me. Nourish is always one of my baby’s and the third trimester had some anxiety for me. Training my kitchen and front of house managers on everything was a lot of time, and preparing them for the events while I was gone was nerve wracking. I am gone on maternity leave for 10 weeks, and we have student employees graduating or leaving for the summer which I have entrusted my managers to have new people hired and trained for when I get back. I have full faith that they will do a great job while I am gone. 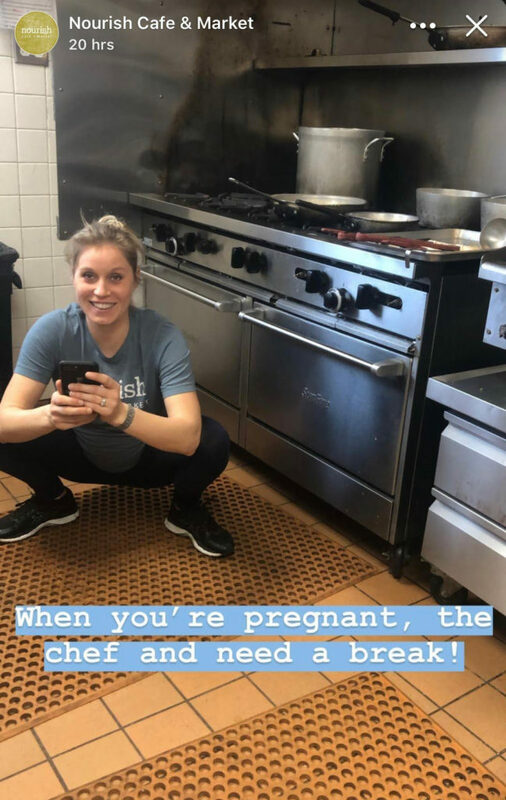 I got to teach my last few cooking classes during my third trimester. My cooking classes are my heart and soul. I truly believe everyone deserves the gift of good health, and teaching others my tricks to cooking is a blessing in my life. Sharing my knowledge is all I want to do with healthy inspiring cooks. 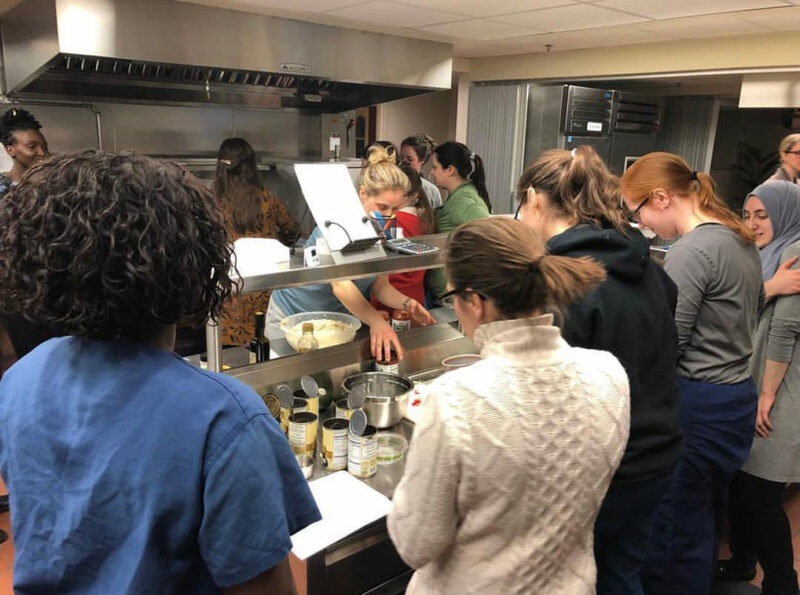 I also, was lucky enough to get to do a cooking class for the OBGYN department of Women’s and Children’s Hospital during my 36th week. We made a plant based meal without any oils. I can’t express how inspired and grateful I was to have my doctor set this up, and I hope to do more of these in the future! Hosting a special cooking class for the OBGYN department at the Women’s and Children’s Hospital . Now, let’s talk about all of the delicious food I ate while in my third trimester. usually a smoothie with low sugar, lots of superfoods and veggies because I could continue to work without having to stop and eat. Lunch was a cheat meal (for me) but had a lot of calories: a sandwich, french toast, burrito, large salad with chicken or another bowl similar to breakfast. A small snack after lunch, like an energy bite or piece of fruit. Since it was cold during my third trimester, I made a ton of soups and bread rolls. Veggie, chicken noodle, tomato basil, potato soups were just some of the soups I would create. The herbs I would use in my soups were always immune boosting since there were a lot of illnesses going around and I wanted to protect my family. Once my daughter was in bed and my husband and I were relaxing I’d have Coconut Bliss Salted Caramel Chocolate Dipped Ice Cream Bar. It was the best part of each night. I did this meal planning for the majority of my third trimester. I went into labor when I was 39 weeks and 5 days pregnant. I was 3 1⁄2 centimeters dilated as I arrived at the hospital, and from there went through my labor and delivery with my husband and had our beautiful baby girl, Reese Kay Dean, on March 5th, 2019. I appreciate all of you that went through my pregnancy journey with me and have supported my healthy lifestyle along the way. 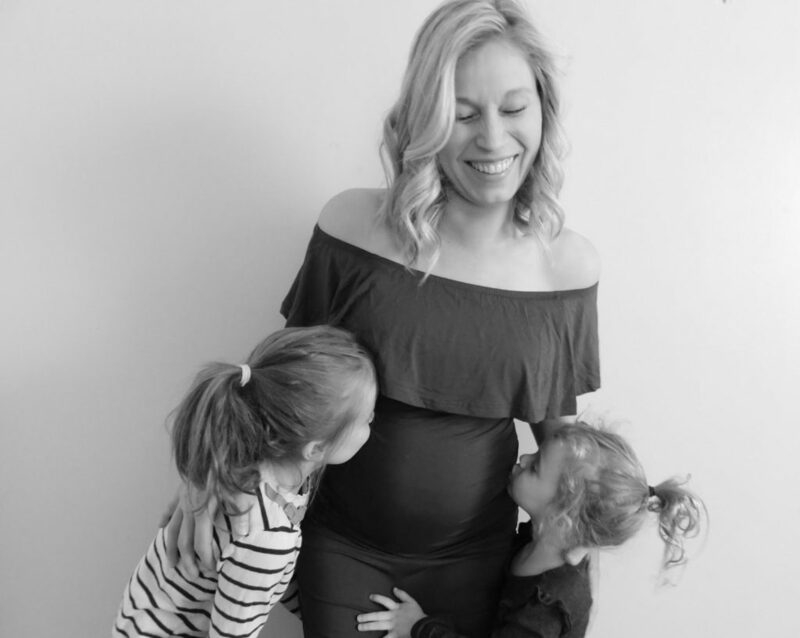 Check out my next post on labor, delivery and the first weeks after Reese’s arrival – coming soon!